Philips' New Map of London Extending Four & a Half Miles Round Charing Cross. 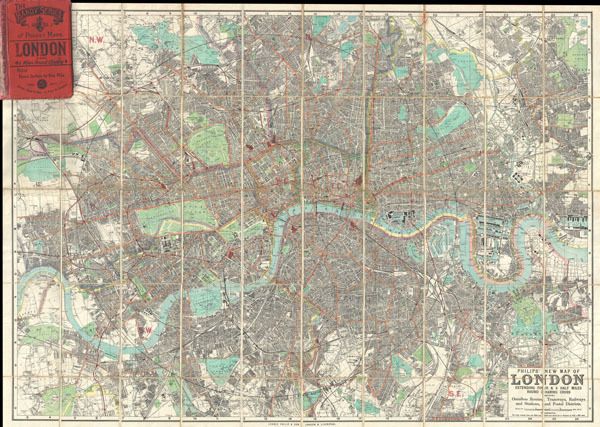 A stunning example of George Philip's c. 1985 folding pocket map of London, England. Covers the urban center of London from Barnes in the west to Victoria Dock in the east, as well as north as far as Finsbury Park and south as far as Brockwell Park, thus covering London in a roughly 4.5 mile radius from Charing Cross. Offers incredible detail at a scale of 3 inches to 1 mile, with notation for all major streets, trains lines, parks, docks, districts, and important buildings. Issued as part of the 'Handy Series of Pocket Maps' issued by George Philip & Son from their offices at 32 Fleet Street, London, England. Very good. Dissected and mounted onto linen in 50 panels. Folds into original linen binder. Hyde, Ralph, Printed Maps of Victorian London, 1851 - 1900, 223B/5.